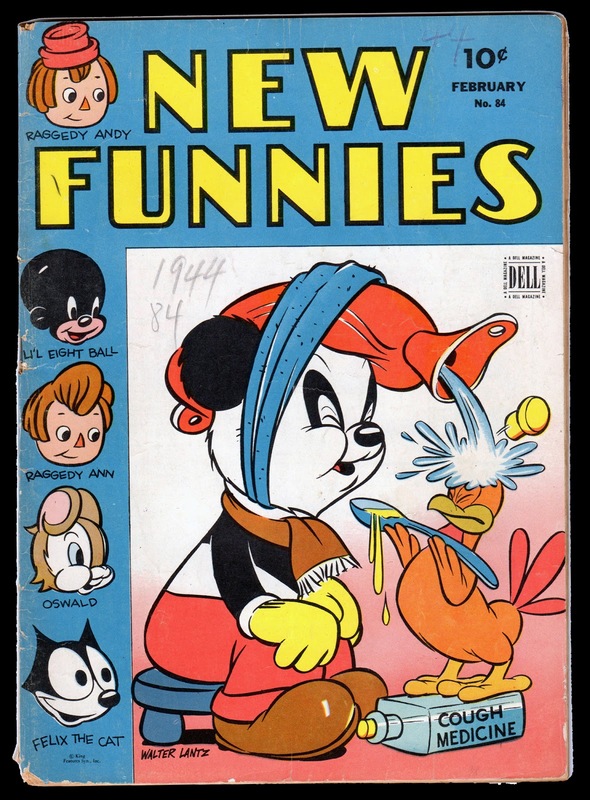 Thanks to Michael Barrier for his kind scanning of the three remaining issues of New Funnies I didn't have in my John Stanley archives. 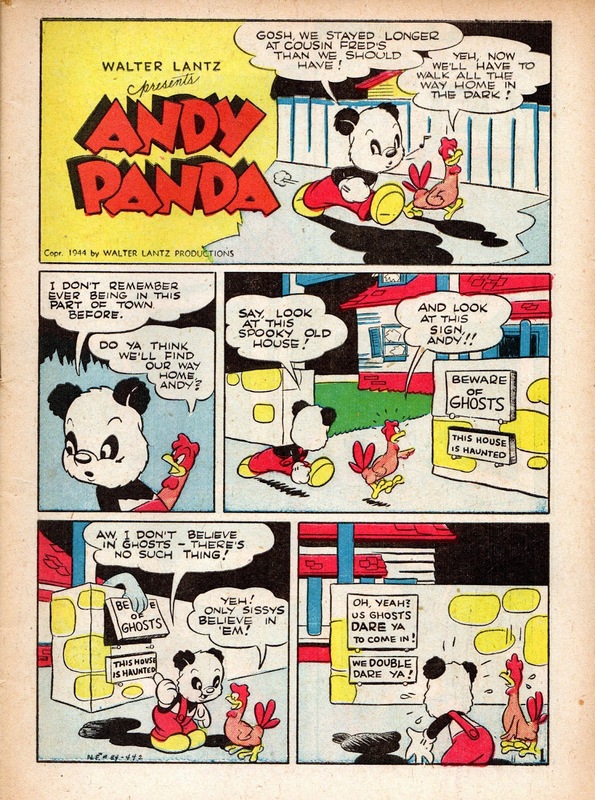 From the earliest of these issues, NF 84 (cover-dated April, 1944) comes this energetic, faintly anarchic and charming "Andy Panda" story. Today marks my 49th birthday--and the only day of my life that I'll be 49 on 4/9. 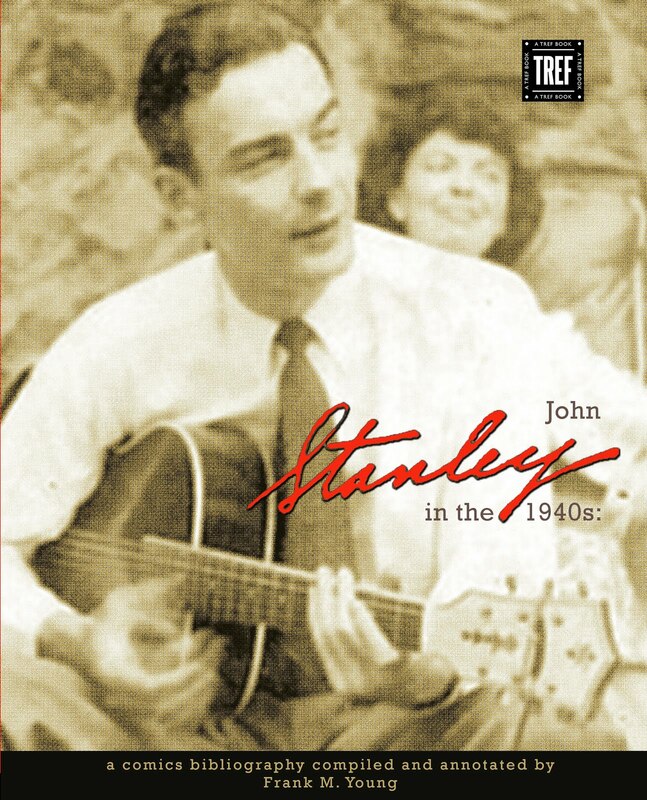 With Barrier's kind consent, I share this very rare story as a birthday present to John Stanley admirers everywhere. It's noteworthy as the first John Stanley comics story with an overtly supernatural theme. 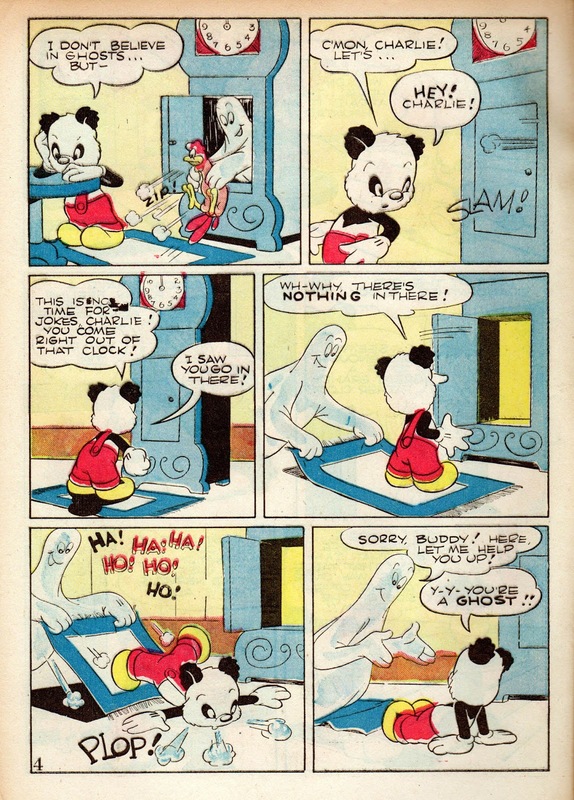 As mentioned in my previous post, Stanley had an evident fascination with horror/supernatural themes. I don't know if he thought the supernatural was hogwash or not. 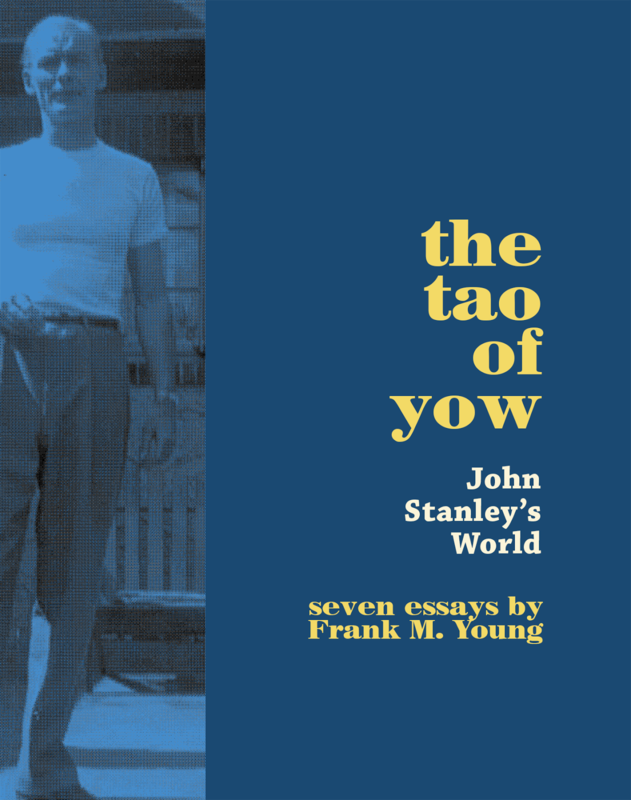 He often debunks its apparent presence as a narrative twist. 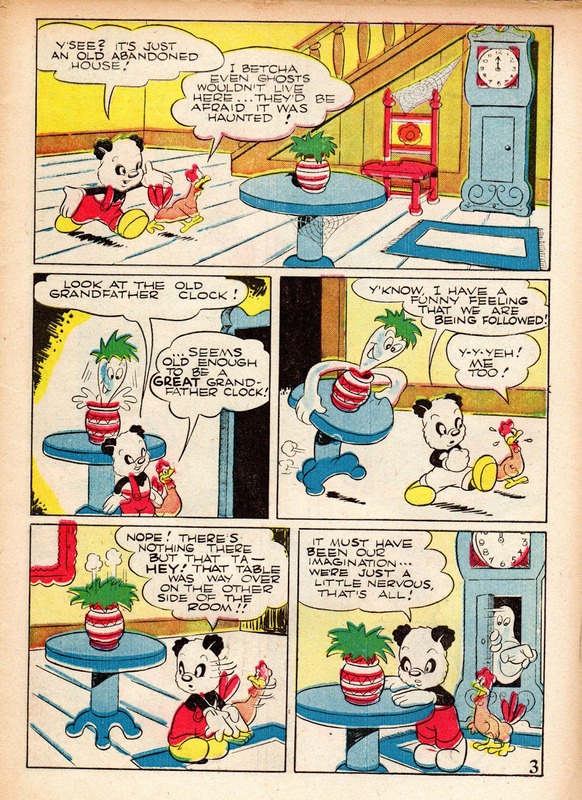 He also often treats such themes with considerable respect. 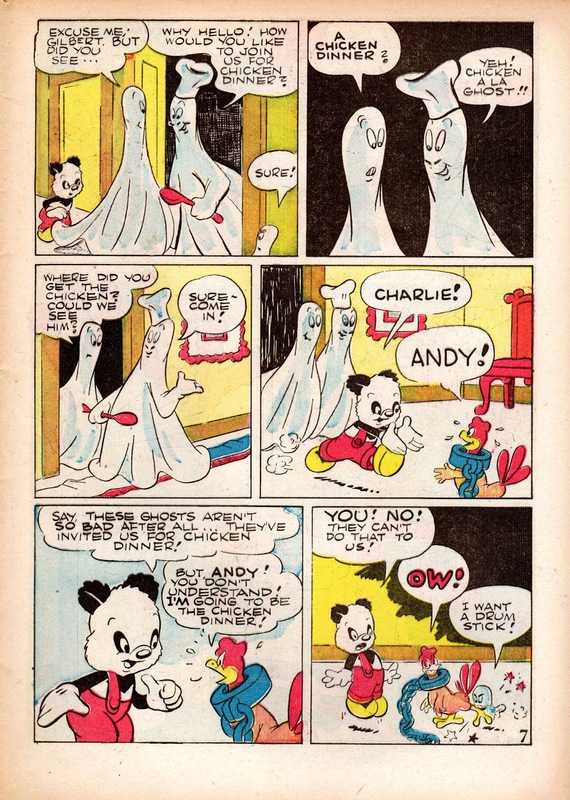 They are a rich part of the fabric of the numerous fairy tales told by Lulu to Alvin in issue after issue of Little Lulu. 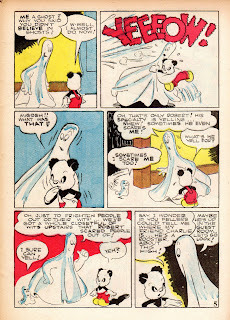 His infamous pair of early 1960s horror comics, Ghost Stories #1 and the one-shot Tales From the Tomb, take an unusual spin on such themes, but still treat them with reverence. 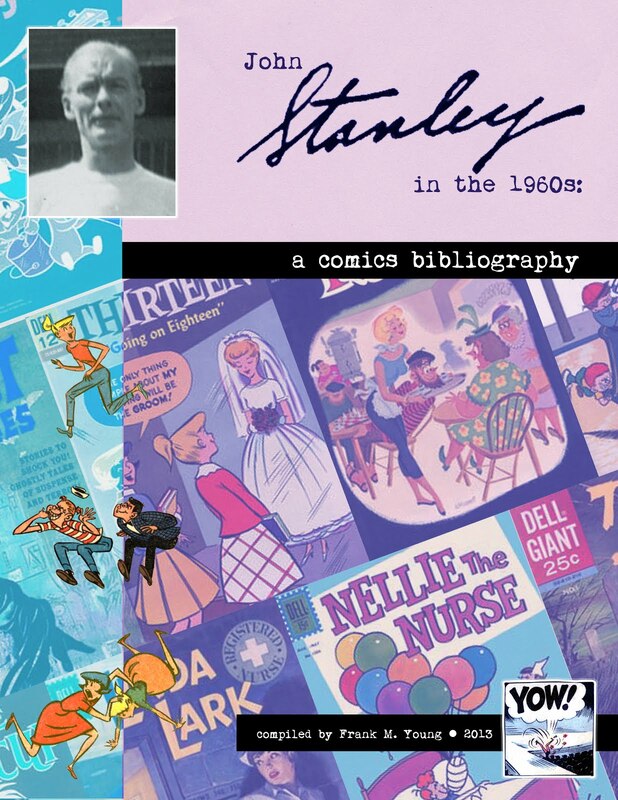 In his first year as a comics creator, Stanley worked more cautiously, and focused on comedy and character relationships. Genres and themes were just window-dressing, to give the stories variety. 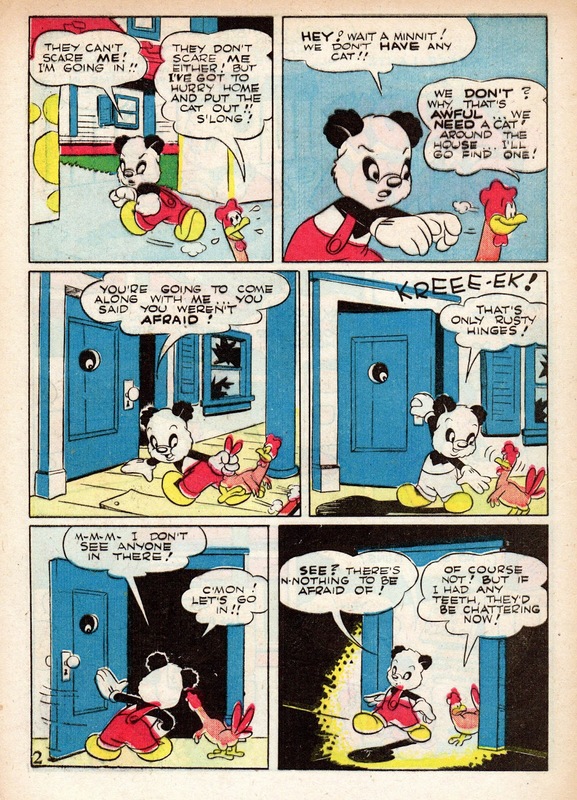 It wasn't until the untitled story in his first Oswald Rabbit one-shot, published one year later, that Stanley made his first bold step into the outright inexplicable and supernatural. That story, posted here in 2008, is also among his only unbridled screwball stories. 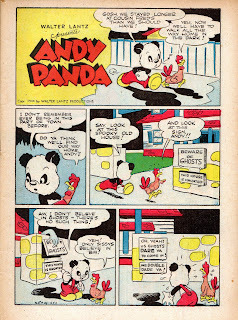 Dig around in this blog's back pages and you'll find it. 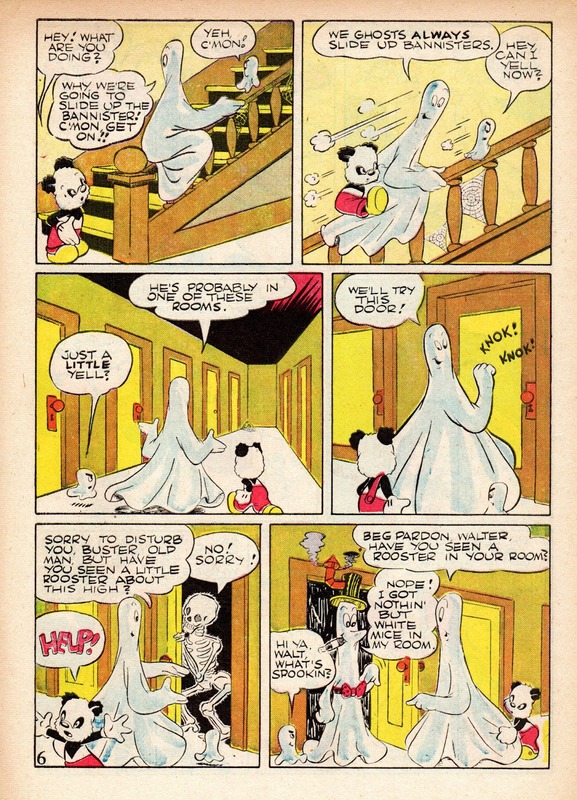 Stanley handles the spook elements uncertainly in this early effort. 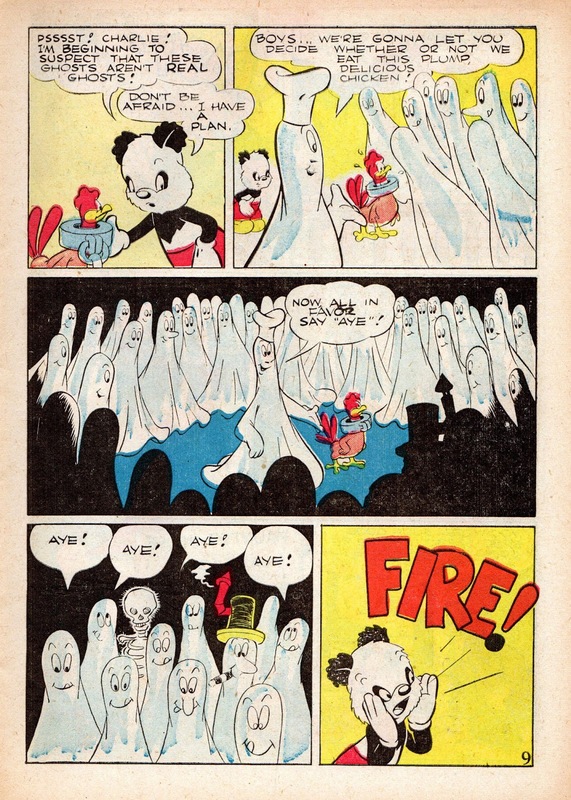 Before the 1944 "Scooby Doo" twist is revealed, the spirits are, indeed, spirited, and prove intense, unpredictable foils for panda and chicken. 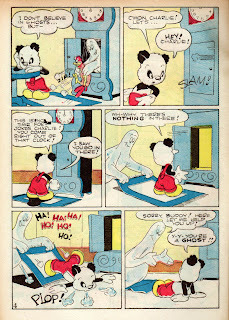 That said, among the fake ghosts are one of his first Tubby-esque characters. Robert, the apparent midget of the haunted house crew, is obsessed with yelling. 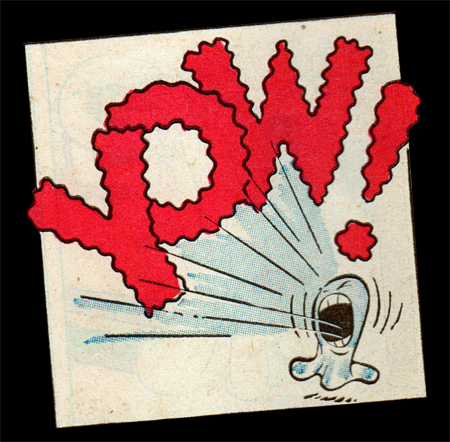 This post's title quotes from the delightful moment on p.6, panel 2, where Robert requests permission to yell in the midst of a seemingly impossible physical event. 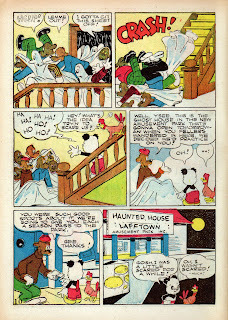 Stanley drops the first name of his friend and Western Publishing colleague Walt Kelly on the last panel of p.6. 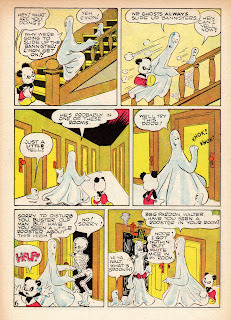 Ghost Walt, who smokes a tell-tale cigar, wears a stovepipe hat, in an apparent nod to the likes of Bill Holman's screwball comic strip Smokey Stover. 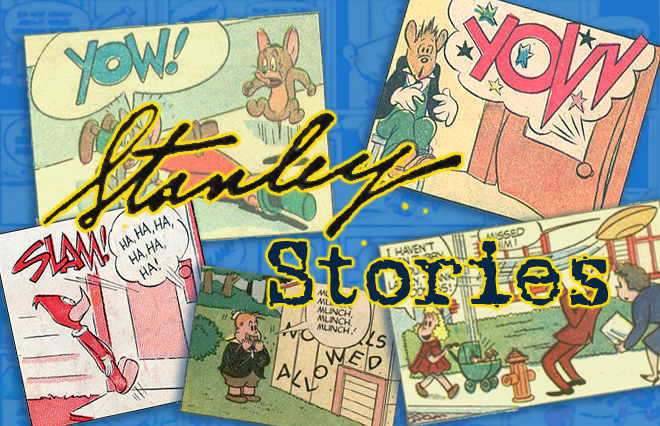 Stanley's first masterpieces were a year away, but his 1944 stories show a remarkably quick development as a comic book creator. 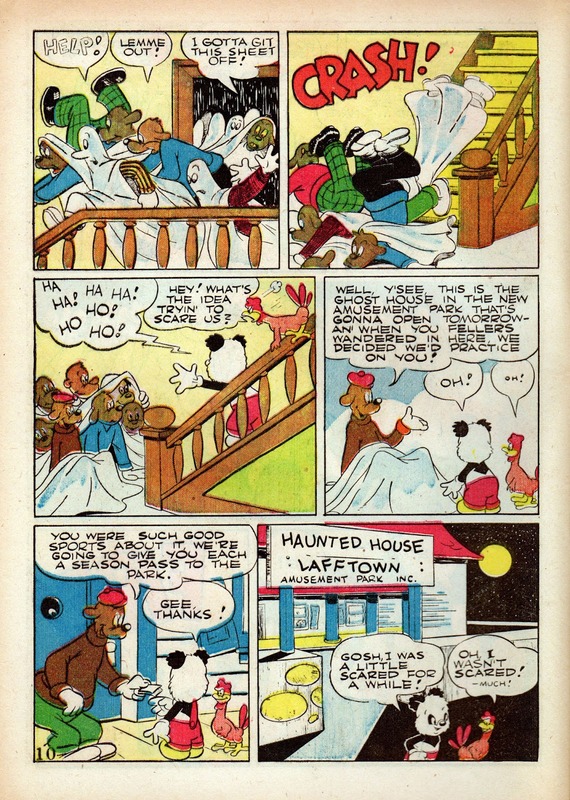 He grokked the form almost immediately, and added his own touches to the comics lexicon, as both cartoonist and storyteller. For dessert, here's the cover--again penciled by Stanley and inked by someone else on the Western Publications staff. Initially my interest in John Stanley was limited solely to Little Lulu, Tubby, and Eighteen. Thanks to you I've now become completely hooked on his wonderful 1940s non-Lulu comics, especially ones like this terrific Andy Panda tale, which is really on a par with those incredible Lulu and Tubby ghost stories that came later. 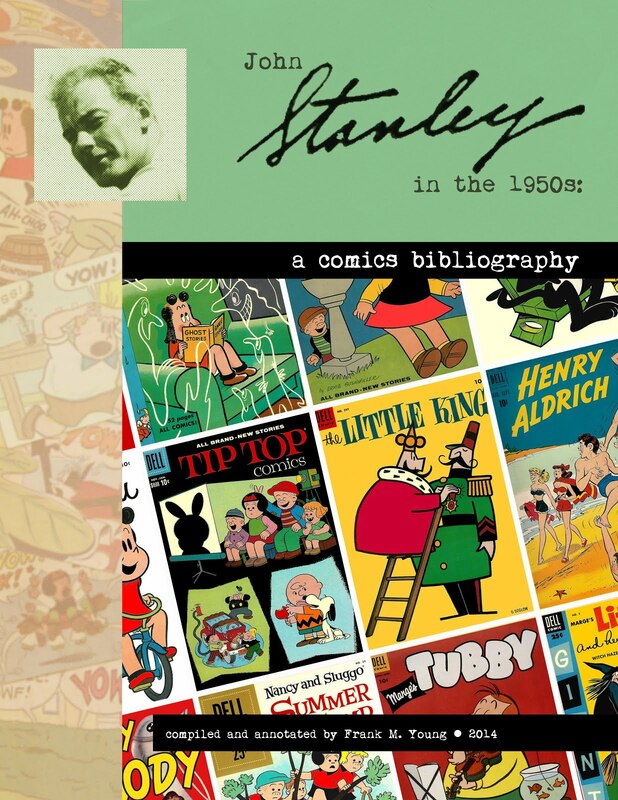 As an avid Lulu / Stanley fanatic for an amazing sixty years, I thank you! Thank you for your kind words. 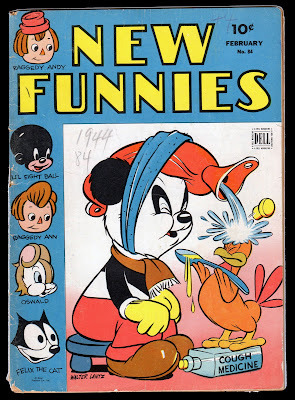 It's encouraging to receive your thoughts and reactions to this early non-LULU material. 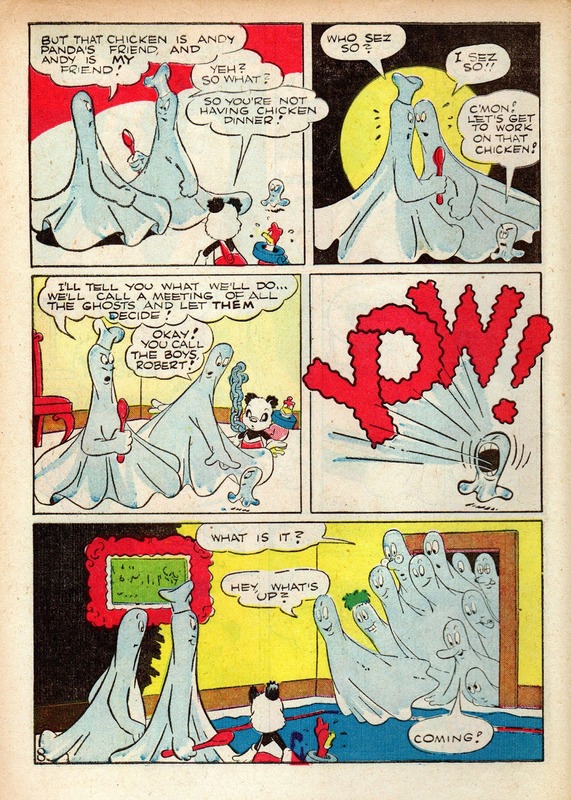 I consider it the equal of John Stanley's other work, and an important source of many significant developments in his growth as a comics storyteller. I sometimes wonder if these stories are of much interest to others. Your reactions (like those of my esteemed colleague Thad K.) are reassuring.